Francesca Dale in Art & Photography on 8 September, 2015. The MUMOK museum situated in the heart of the Museum Quartier in the Austrian capital of Vienna is also known as Museum Moderner Kunst. The MUMOK is the largest modern art gallery in Central Europe, holding over 10,000 pieces in total. In February 2015 the MUMOK introduced the exhibition of ‘Ludwig Goes Pop’, which presents one of the largest international Pop Art exhibitions, with significant works from artists such as Lichtenstein, Warhol, Rosenquist and Rauschenberg; pieces will have been taken from the various Ludwig collections around Europe. The exhibition was of a multimedia nature exhibiting screen prints, paintings, books, records and films to complete an accurate representation of the dynamic and revolutionary Pop Art movement, which fascinated the Ludwigs immensely. Pop Art was founded firstly in Britain in the late 1950s and then spread to the United States, most notably New York in the 1960s, where the most prominent figures of the movement originated from, and exhibited their work. Thus, New York became one of the leading art capitals of the world. Pop artists were known for their celebration of ordinary people and of the objects of everyday life, in an effort to elevate popular culture to the level of fine art. This was initially highly criticised by traditionalist art critics who favoured the idea of ‘art for art’s sake’ which was exemplified in the Abstract Expressionist works of Jackson Pollock only a few years earlier. 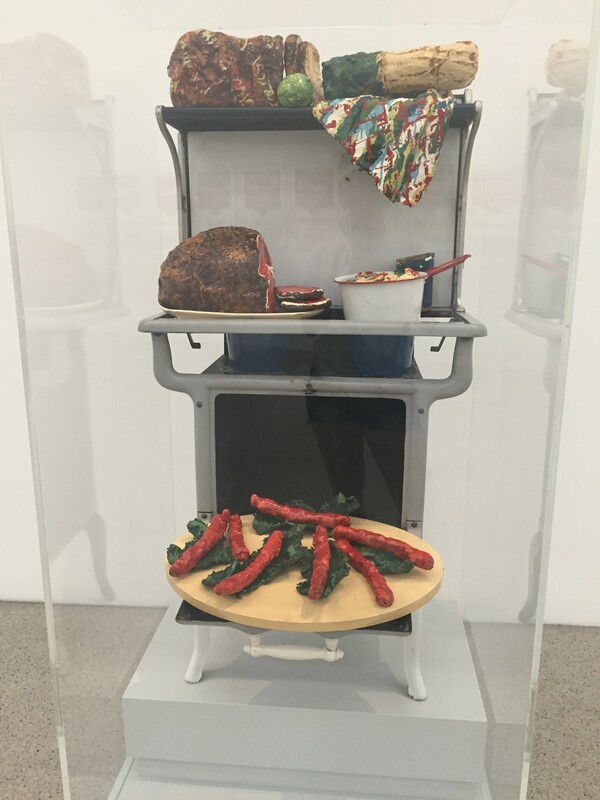 The key features of the artists’ work was to use objects from mass culture, known as kitsch, and modern media in order to blur the boundaries between ‘high’ art and ‘low’ culture. The artists embraced the post-WWII manufacturing and media boom and projected images of the capitalist market in their art. 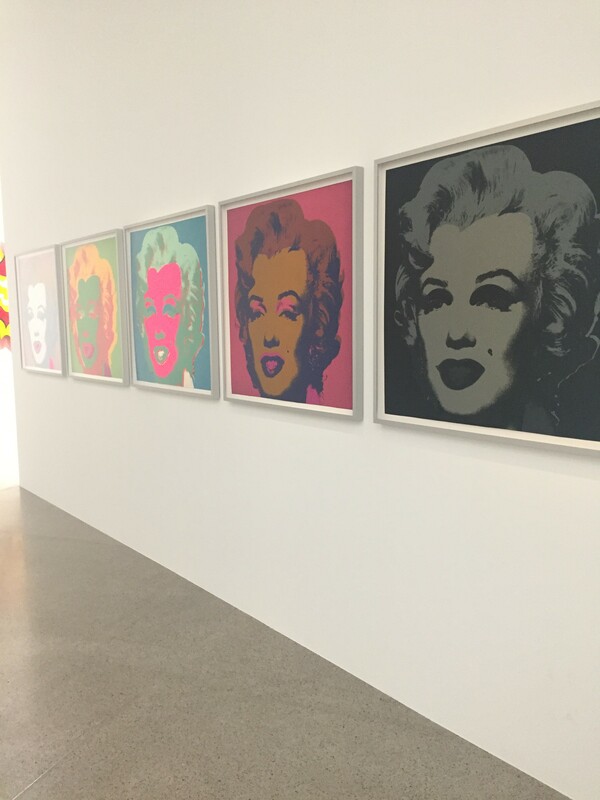 Andy Warhol is arguably one of the most iconic Pop artists in history. Warhol produced pieces focusing on pop stars and artists of his contemporary era, including Marilyn Monroe and Elvis Presley, which are both exhibited in the MUMOK. Warhol’s 1967 screen-print series of ‘Marilyn’ are recognised internationally as he used the same publicity photograph from her 1953 film, ‘Niagara’. Warhol was fascinated by the cult of the celebrity, which had the ability to influence the media, culture and journeys of life. Warhol made more than twenty silkscreen paintings of Marilyn; by repeating and juxtaposing the image of her face in different colours and shades he was able to create a sense of her constant presence in the media and the obsession the public had with celebrities. Roy Lichtenstein has produced many iconic Pop Art works, which include the imagery of American cartoon strips and comics. His paintings were created using the Ben Day dot system; this involves a cheap colour printer reproducing an image using hundreds of tiny dots of colour applied individually. The mechanical approach that Lichtenstein uses to create his paintings is also reflected in his use of stencils. Lichtenstein emulated characteristics of the Pop Art movement as he brought cartoon imagery which was considered to be a banal subject matter into the world of high art. Lichtenstein’s most notable work include the face of a distressed young female with the script of her thoughts concerning romance, however the MUMOK contained some other works of Lichtenstein of which the subject matter concerned a still life or landscape. Lichtenstein’s ‘Cubist Still Life with Lemons’ (1975) is representative of his experimenting period with still life painting in the 1970s. 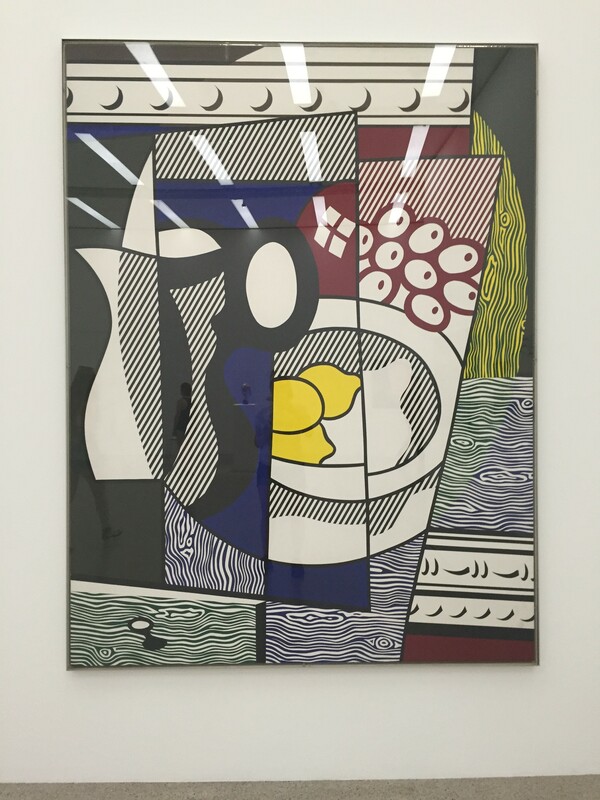 Lichtenstein’s Pop Art works also display a strong influence from Cubism which can be seen in his use of overlapping planes, three-dimensionality and reflections, whilst maintaining a flat appearance. James Rosenquist was one of the leading Pop Artists in the 1960s, engaging in painting and lithography. Before Rosenquist became an artist he practised industrial painting and sign painting, and worked on billboards that featured in Times Square, New York. He began to work with iconic images and advertisement images, juxtaposing them next to each other in order to transgress the connection between them and their further meanings. Rosenquist is known for the variety of media used in his pieces, with materials that range from plastic, mirrors, electric light, paint and Perspex. Rosenquist’s exhibited piece ‘Untitled’ (1964) presents the actress Joan Crawford advertising a brand of soap or cigarette. In this work Rosenquist wants to comment on the link between advertising and Hollywood and the impersonality of it all. Crawford’s face meets stereotypical cosmetic standards and her expression seems to be surprised or perplexed. In ‘Untitled‘, the artist is trying to show the viewer that society is dictated by men and that women are seen as a luxury item which can be used for advertising products, and in doing so, Rosenquist suggests that contemporary advertising dehumanises the female gender. ‘Ludwig Goes Pop’ is on exhibition at the MUMOK, Vienna until 13th September 2015.